Isabella has been out of the school for the last week since the flu has been running rampant through the school. Yesterday, she went to work with me and had a great day. All of the people at work were so happy to see her and she actually came home with a few unexpected gifts and office supplies! 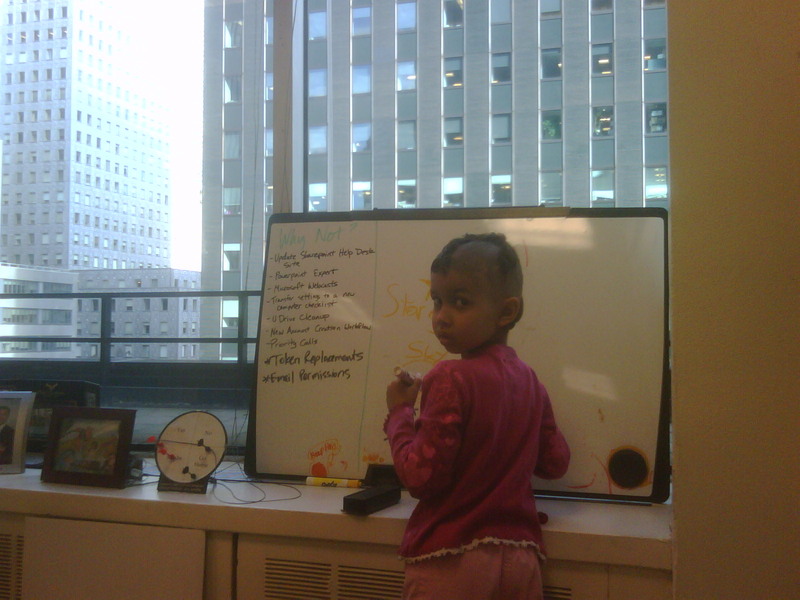 Here she is drawing up a grand plan on my whiteboard at work. The school also notified us that the absences were back down to normal levels so Isabella was able to go back to school today. So she had an unexpected mini-vacation and got to go on a bunch of field trips with mommy and daddy. Not a bad deal! It was exactly a year ago today when our family embarked on this journey, when Isabella began her fight. It was a year ago when an MRI revealed a giant tumor in Isabella's head. I just went back and read the blog entries for the first couple months and am amazed at everything that we actually went through to get where we are today. I was immediately flooded with emotion and relived the emotional roller coaster that we went through in those first few turbulent weeks. A year ago, we weren't even sure whether Isabella would live to see another year, but here we are a year later, with Isabella done with all of her treatments and back in school - well, technically, she would be in school if the flu wasn't making its rounds through the school. Immediately after her surgery, Isabella couldn't even move her right arm and couldn't walk. Today, even though she has "switched" to become a lefty, she is continually improving and strengthening her right hand and she runs like any normal six year old. We still don't know what lies in her future, but honestly, we don't know what lies in any of our futures. If this whole ordeal has taught us anything, it's to be thankful and enjoy each day. A year ago,we spent Thanksgiving at the hospital and one of my wishes was that a year from then, we would be able to spend Thanksgiving home with Isabella. I am thankful we will be able to to that this year. Below are just a few of the pictures that show what an incredible year it has been. Here is Isabella, immediately after her surgery to remove her brain tumor. Amazingly, this next picture was taken less than week after Isabella had her surgery. Since Isabella couldn’t walk for a couple weeks after surgery, she used a wheelchair. Too bad Nathaniel thought it was also to get him around! This picture was taken by Shira Weinberger during a photo shoot at the hospital. Notice how chubby Isabella was! A few weeks after she started chemotherapy, Isabella’s hair started falling out. But since most of her hair was in a giant, knotted clump after the surgery, her hair stuck around for a while. Finally, Isabella’s clump of hair fell out (we still have it somewhere), and she was not affected a bit. After Isabella completed her chemotherapy, she came home and returned to being a regular kid, taking swim lessons and swinging on the monkey bars. Here is Isabella at her 6th birthday, and you can see her hair growing back nicely! Here, Isabella rings the bell at Boston Mass General to signify the end of her proton radiation treatment. Isabella waits with her brother and sister at the bus stop on her first day of school. Amazingly, Isabella only missed two days at the beginning of the school year due to the radiation therapy. Here are Annalise, Nathaniel, and Isabella about to go trick or treating.